This episode was recorded in 2012, but through a sequence of unfortunate and lazy events, it is only now being released in July 2013. See how prescient we were about the future, discover whether the world ever came to an end, find out about the Singularity & fashion, why Google makes cars, and what the difference between birds and planes tells us about AI. The mayan prophecies suggest the world is about to end. Will we survive 2012?! Are we shaping the Singularity, or is the Singularity shaping us? Do we just exist to serve the purpose of the machines? Are we just serving in someone else’s story, or do we write our own? What Technology Wants, the book that triggered these questions. Is culture homogenizing? Will the whole world wear Levi’s and drink Coca-Cola? Is Facebook proof that the whole world will turn into isolated echo chambers? Is the singularity gaining public awareness? 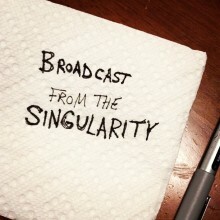 Will the Singularity be boring? And if so, what will be the next stage of technological evolutionary hipsterdom? Are we going to have to choose sides in the Singularity?